Tell us what exactly you need, and the digital marketing specialist will deliver. Almond is a veteran digital marketing agency based in Amman, Jordan, that has made its impact felt in the web industry loud and clear. Established in 2005, the company has been promoted by some highly skilled specialists dedicated to deliver total web and digital marketing solutions under one roof. Let’s schedule a free 1 hour consulting session with one of our specialists who will specifically address your inquiries and concerns related to search engine optimization, social media marketing / optimization, PPC advertising, search engine marketing and email marketing strategies. What can Almond do for you? Are you looking for a custom, well-structured, high quality website design that will effectively adapt to the future growth of your company? You have found your answer with our professional website design services. Make your website easy-to-find on Google, Yahoo!, Bing & more! Now a days, most people use the internet when searching for products and services – make sure those people can easily find you on the internet. You’ll be guided through the use of ideal practices and tools that will improve your resources and your social media message, so that you can promote your business, and run your business, simultaneously. Effective PPC management is probably the most important part of executing a winning paid advertising campaign. It is not enough to simply “set it and forget it” – you need to be willing to hire experts in this field. Without a blog for your business, you will have a big problem in your content marketing strategy. Whilst having a blog, you will definitely make Google love your site, and engage your customers day-after-day. Almond’s digital marketing training and mentoring will help you get access to insider knowledge, tactics, action items you can take to enhance your website’s performance, and increase your online visibility. AlmondMailer is an email marketing software that help you send tailor-made offers to your clients when they’re most active. You can install on your own PC or server - no monthly fees. 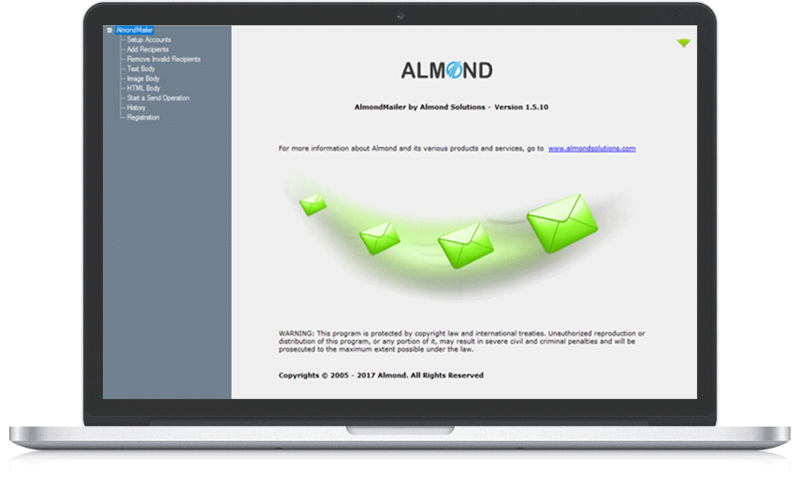 With AlmondMailer, you can send 10 different offers using 10 different SMTP servers concurrently – Multithreading. This is what make our software unique! READY TO DISCUSS YOUR DIGITAL MARKETING PROJECT?